The Pont du Gard is a notable ancient Roman aqueduct bridge that crosses the Gard River in southern France. 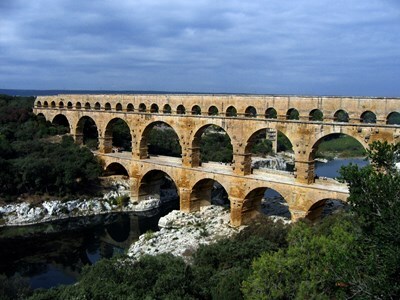 It is part of a 50 km (31 mi) long aqueduct that runs between Uzès and Nîmes in the South of France. It is located in Vers-Pont-du-Gard near Remoulins, in the Gard département. The aqueduct was constructed by the Romans in the 1st century AD and was added to UNESCO's list of World Heritage Sites in 1985. This description uses material from the Wikipedia article on Pont du Gard and is licensed under the Creative Commons Attribution-ShareAlike License (view authors).